Construction equipment costs the industry billions of dollars every year. 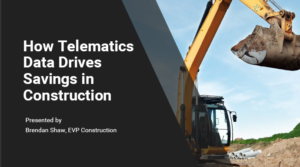 This hour-long webinar shows how smart companies are using actionable data from their own equipment to drive cost savings. Our speaker Brendan Shaw has years of experience helping construction sites use data to ensure better transparency on jobs. Companies he’s worked with enjoy reduced costs and more job site reliability. Sign-up today to see how you too can put money back in your pocket.